Last week, Google released a new advertisement that tells an emotional story of two childhood friends separated in 1947 as Hindus mass migrated from Pakistan to India, and Muslims left India for Pakistan. Decades later, the friends are reunited with the help of their grandchildren and Google. Produced in the form of a short film, the ad has gone viral in the two countries with more than 4 million views. The feel-good ad may be surprising to Western viewers, who are likely familiar with the two nations’ antagonistic relationship. India and Pakistan have been divided by decades of political animosities, a nuclear arms race and several wars. 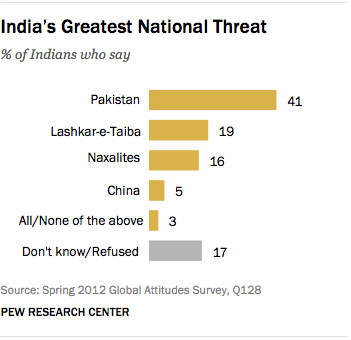 Indians and Pakistanis see each other’s country as the biggest threat to their national security, according to Pew Research’s 2012 polls in the respective countries. When asked to choose the most serious threat to their country, 41% of Indians point to Pakistan. Among Pakistanis, 59% pick India. But, as the video suggests, there are complicated cultural and historical ties that also run deep between the people of the two nations. In surveys, a majority of people in both countries say they want to improve relations with the other. Seven-in-ten Indians say it is important to improve ties with Pakistan. Among Pakistanis as well, a majority (62%) say that improving relations with India should be a priority.